Marc Lavarin, an assistant minister at Alfred Street Baptist Church, hugs Howard University student Mya Thompson after she learns the church's members have paid the $2,500 she owed the university. Mya Thompson is a senior at Howard University in Washington, D.C. Late last month, the 25-year-old was on track to graduate in May, but she still owed the school $2,500 in tuition and fees – not a huge sum, but she likely wouldn't get her diploma unless she could come up with the money. "I get grants, I get loans. I get a need-based scholarship from Howard ... But my financial aid usually doesn't cover everything," says Thompson, who also works at D.C.'s 911 call center and is raising her young son. "I just had to figure out how I was going to handle my everyday bills and set aside $2,500." Then two weeks ago, she got an email from the office of financial aid at Howard, a historically black university, promising an amazing opportunity if she would just come in and learn about it. She expected to sit through a seminar about something else she would need to apply to. But when she got to the financial aid office, she was surprised by pastors from Alfred Street Baptist Church in Alexandria, Va., telling her that the church was going to cover the balance she owed. "It was overwhelming," she tells NPR. "I was shocked. I was excited. I wanted to cry." "I was going to have to cover the balance no matter what. But the fact that I don't have to worry about it," she says, "is definitely a weight lifted off my shoulders." Thank you @AlfredStreetBC for paying the balances that stood between 34 graduating seniors and their graduation in a few short months. The grant was just part of a $100,000 gift that Alfred Street Baptist Church made to Howard University that day, paying the debts of 34 students like Thompson, who owed sums ranging from $100 to more than $3,000. Alfred Street had raised the money via a church-wide fast during the month of January, during which congregants committed to doing without certain things, from not consuming sweets or alcohol to abstaining from social media. They were also asked to undertake a "financial fast," and eliminate spending on non-essential items. The church pastors "asked them to abstain from frivolous spending and asked them to be faithful over what God would have them to sow back into the community," explains assistant minister Marc Lavarin, who focuses on the church's young adult and online ministries. "And we had an overwhelming response from our congregation." So on the last weekend of January, the church asked members to donate the money they'd saved during their financial fast. Members weren't told what their money would fund, only that it would go back into the community. In its four services that weekend, the church raised $150,000. Alfred Street Baptist Church was founded in 1803, and its ties to historically black colleges and universities, or HBCUs, run deep. Church officials estimate that 60 percent of the 8,000 active members of Alfred Street are graduates of HBCUs. Later this month, the church will put on its annual HBCU College Festival, which began in its basement 17 years ago. More than 10,000 students and their families are registered for this year's event, which is now so large that it will be held in Washington's convention center. "We believe that it's the role of the church, especially those historically black congregations, to continue to support our historically black colleges and universities — especially considering we have played such a role in their conception and founding," Lavarin tells NPR, noting that many HBCUs were started by religious organizations. Lavarin, a 2018 graduate of Duke Divinity School, himself has student loans to repay. He says that the worshippers' gift was a way to both support HBCUs and ease a burden borne by individual students. "In many instances it's not their academic aptitude that's keeping them back," Lavarin says. "Oftentimes it's debt — it's their ability to pay off the remaining gap that they owe on their account from tuition and financial aid." That notion — that money spent helping students to cover small financial shortfalls is well spent — is starting to is gain attention. Georgia State University, in Atlanta, has launched a program that provides "micro grants" to students facing modest financial difficulties that could cause them to drop out. The university, where 72 percent of bachelor's degree-seeking students have some level of unmet need, now provides grants as small as $300 to keep students on their path to graduation. It says that 86 percent of students who receive these small grants have gone on to graduate. For Thompson, a public relations major who hopes to become a music publicist, the donation from Alfred Street removes one hurdle. She still faces an estimated $50,000 in student loans for the cost of attending Howard and Clark Atlanta University, where she was first enrolled. With graduation just three months away, Thompson admits to some concern about paying back her loans. But with a college degree from Howard in hand, she'll be better positioned to get a job that will help her pay off those loans. "I mean who isn't worried about the loans that they have to pay back?" she says. "I'm prayerful, praying that God has my back on this, too, and that we'll get through it together." Lavarin, the minister, explains that the church's gift is a way to invest in the students, and show them the community is united behind them. "I believe they'll be able to recognize just never to give up hope," he says. And his own hope is that the students will pay it forward. 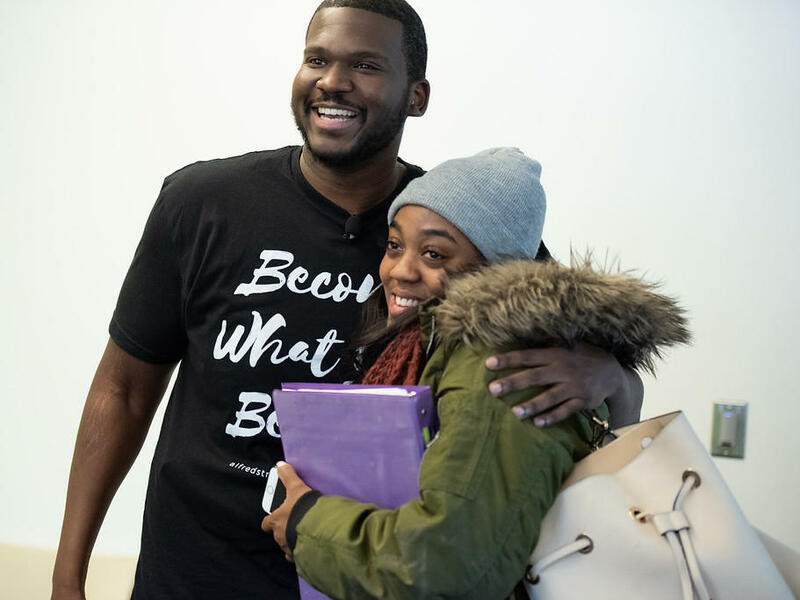 First by graduating and achieving all they can — and then returning to support Howard and other HBCUs in educating the generations that follow.